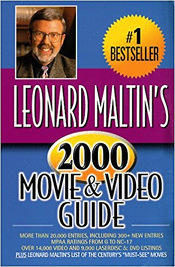 100 Must-See Films of the 20th Century: Leonard Maltin's Movie and Video Guide 2000 contained the exclusive list of the author's "100 Must-See Films of the 20th Century" - an excellent starting point for film viewing. As the leading film historian and critic Maltin admitted, "these are not the only great films of the century, or the only ones worth seeing." They could have been supplemented with more silent films, more foreign films, documentaries, shorts and cartoons, more from directors Frank Capra, John Ford, Buster Keaton, Preston Sturges, Billy Wilder and Joseph Mankiewicz, and Robert Altman. Eighty-one of the 100 films on this list were found on the list of 200 Greatest Films recommended at this site. The two lists were remarkably similar, although Maltin had ten foreign-language films in his choices. The landmark of American motion pictures. Griffith's epic story of two families during Civil War and Reconstruction is still fascinating. Sometimes the drama survives intact; other times, one must watch in a more historical perspective. Griffith's portrayal of Ku Klux Klan in heroic role has kept this film a center of controversy to the present day. Landmark American epic, interweaves four stories of prejudice and inhumanity, from the Babylonian era to the modern day. Melodramatic, to be sure, but gains in momentum and power as it moves toward its stunning climax. That's Lillian Gish as the mother rocking the cradle; Constance Talmadge gives a most appealing and contemporary performance as the sprightly Mountain Girl. Buster goes to the South to claim a family inheritance, and falls in love with the daughter of a longtime rival clan. Sublime silent comedy, one of Buster's best, with a genuinely hair-raising finale. Incidentally, Buster married his leading lady in real life. Powerful adaptation of Frank Norris' novel McTeague, about a simple man whose wife's obsession with money eventually drives him to madness. Even though von Stroheim's film was taken from him, and severly cut by the studio (it originally ran eight hours), this remains a stunning work, one of the greatest of all silent films. The final sequences in Death Valley are unforgettable. Immortal Chaplin classic, pitting Little Tramp against Yukon, affections of dance-hall girl, whims of a burly prospector. Dance of the rolls, eating leather shoe, cabin tottering over cliff - all highlights of wonderful, timeless comedy. Chaplin re-edited film in 1942; that version, with his narration and music, runs 72m. Landmark film about 1905 Revolution. Unlike many staples of film history classes, this one has the power to grip any audience. Odessa Steps sequence is possibly the most famous movie scene of all time. One of the best WWI films ever; clean-shaven Gilbert a wonderful hero. Adoree an unforgettable heroine. Filled with memorable vignettes, and some of the most harrowingly realistic battle scenes ever filmed. A gem. One of Lloyd's best remembered films casts him as collegiate patsy who'll do anything to be popular on campus, unaware that everyone is making fun of him. Football game finale is one of several comic highlights. A real audience-rouser. One of Keaton's best silent features, setting comedy against true Civil War story of stolen train, Union spies. Not as fanciful as other Keaton films, but beautifully done. Exquisite silent film is just as powerful today as when it was made, telling simple story of farmer who plans to murder his wife, led on by another woman. Triumph of direction, camerawork, art direction, and performances, all hauntingly beautiful. Screenplay by Carl Mayer, from Hermann Suderman's story. Cinematographers Karl Struss and Charles Rosher won Oscars, as did the film for "artistic quality of production." Gaynor also won Best Actress Oscar (shared for her performances in 7th Heaven and Street Angel). Remade in Germany as The Journey to Tilsit. Full title onscreen is Sunrise - A Song of Two Humans. Classic drama about a few happy and many not-so-happy days in the marriage of hard-luck couple. One of the greatest silent films; holds up beautifully. Written by Harry Behn, John V.A. Weaver, and director Vidor, from the latter's original story. Vivid, moving adaptation of Erich Maria Remarque's eloquent pacifist novel about German boys' experiences as soldiers during WWI. Time hasn't dimmed its power, or its poignancy, one bit. Scripted by Milestone, Maxwell Anderson, Del Andrews, and George Abbott. Academy Award winner for Best Picture and Director. Chaplin's masterpiece tells story of his love for blind flower girl, and his hot-and-cold friendship with a drunken millionaire. Eloquent, moving, and funny. One of the all-time greats. Harrowing melodrama about psychotic child murderer brought to justice by Berlin underworld. Riveting and frighteningly contemporary; cinematically dazzling, especially for an early talkie. Lorre's performance is unforgettable. Classic horror film of Transylvanian vampire working his evil spell on perplexed group of Londoners. Lugosi's most famous role with his definitive interpretation of the Count, ditto Frye as looney Renfield and Van Sloan as unflappable Professor Van Helsing. Definitive monster movie, with Clive as the ultimate mad scientist, creating a man-made being (Karloff) but inadvertently giving him a criminal brain. It's creaky at times, and cries for a music score, but it's still impressive...as is Karloff's performance in the role that made him a star. Long-censored footage, restored in 1987, enhances the impact of several key scenes, including the drowning of a little girl. Based on Mary Shelley's novel. Followed by Bride of Frankenstein. Sparkling Lubitsch confection about two jewel thieves (Marshall and Hopkins) who fall in love, but find their relationship threatened when he turns on the charm to their newest (female) victim. This film is a working definition of the term "sophisticated comedy." Script by Samson Raphaelson and Grover Jones. Classic version of beauty-and-beast theme is a moviegoing must, with Willis O'Brien's special effects and animation of monster ape Kong still unsurpassed. Final sequence atop Empire State Building is now cinema folklore; Max Steiner music score also memorable. Followed immediately by The Son of Kong. The Marx Brothers' most sustained bit of insanity, a flop when first released, but now considered a satiric masterpiece. In postage-stamp-sized Freedonia, Prime Minister Rufus T. Firefly (Groucho) declares war on neighboring Sylvania just for the hell of it. Enough gags for five movies, but our favorite is still the mirror sequence. Zeppo's swan song with his brothers. Laurel and Hardy's best feature film; duo sneaks off to fraternal convention without telling the wives; then the fun begins, with Chase as hilariously obnoxious conventioneer. Legendary romantic comedy doesn't age a bit. Still as enchanting as ever, with reporter Gable and runaway heiress Colbert falling in love on rural bus trip. Hitch-hiking travails, the Walls of Jericho, other memorable scenes remain fresh and delightful. First film to win all five major Oscars: Picture, Actor, Actress, Director, and Screenplay (Robert Riskin). Based on Samuel Hopkins Adams' story "Night Bus," originally published in Cosmopolitan. Fields is a grocery store owner who goes West with his family. Beautiful comedy routines in one of the Great Man's unforgettable films. Charles Sellon as a blind man, T. Roy Barnes as a salesman looking for Carl LaFong, contribute some hilarious moments. A remake of Fields' silent film It's the Old Army Game. The Marx Brothers invade the world of opera with devastating results. Arguably their finest film (a close race with Duck Soup), with tuneful music and appealing romance neatly interwoven. One priceless comedy bit follows another: the stateroom scene, the Party of the First Part contract, etc. This is as good as it gets. Eye-filling sequel to Frankenstein is even better, with rich vein of dry wit running through the chills. Inimitable Thesiger plays weird doctor who compels Frankenstein into making a mate for his creation; Lanchester plays both the "bride" and, in amusing prologue, Mary Shelley. Pastoral interlude with blind hermit and final, riotous creation scene are highlights of this truly classic movie. Scripted by John L. Balderston and William Hurlbut. Marvelous Franz Waxman score, reused for many subsequent films. Followed by Son of Frankenstein. Classic Hitchcock mystery with overtones of light comedy and romance, as innocent Donat is pulled into spy-ring activities. Memorable banter between Donat and Carroll, who thinks he's a criminal, set style for sophisticated dialogue for years. John Buchan's novel was adapted by Charles Bennett and Alma Reville; additional dialogue by Ian Hay. One of the best Astaire-Rogers films, with stars as dance team whose romance is hampered by Fred's engagement to girl back home (Furness). Fine support by Moore and Broderick, unforgettable Jerome Kern-Dorothy Fields songs "A Fine Romance," "Pick Yourself Up." Oscar-winning "The Way You Look Tonight." Astaire's Bojangles production number is a screen classic. Charlie attacks the machine age in inimitable fashion, with sharp pokes at other social ills and the struggle of modern-day survival. Goddard is the gamin who becomes his partner in life. Chaplin's last silent film (with his own music - including "Smile" - sound effects and gibberish song) is consistently hilarious, and unforgettable. Final shot is among Chaplin's most famous and most poignant. Superb adaptation of Sinclair Lewis novel about middle-aged American industrialist who retires, goes to Europe, where he and his wife find differing sets of values, and new relationships. Intelligently written (by Sidney Howard), beautifully filmed, extremely well acted, with Huston recreating his Broadway role. Won Oscar for Interior Decoration (Richard Day). Unusually mature Hollywood film, not to be missed. Cooper is Longfellow Deeds, who inherits 20 million dollars and wants to give it all away to needy people. Arthur is appealing as the hard-boiled big-city reporter who tries to figure out what makes him tick. Capra won his second Oscar for this irresistible film, written by Robert Riskin (from Clarence Budington Kelland's story "Opera Hat"). Renoir's classic treatise on war, focusing on French prisoners during WWI and their cultured German commandant. Beautiful performances enhance an eloquent script (by Renoir and Charles Spaak). Walt Disney's groundbreaking animated feature film - the first of its kind - is still in a class by itself, a warm and joyful rendition of the classic fairy tale, enhanced by the vivid personalities of the seven dwarfs. Only a real-life Grumpy could fail to love it. Songs include "Whistle While You Work," "Heigh Ho," and "Some Day My Prince Will Come." Dashing Flynn in the definitive swashbuckler, winning hand of de Havilland (never lovelier as Maid Marian), foiling evil prince Rains, dueling wicked Rathbone. Erich Wolfgang Korngold's outstanding score earned an Oscar, as did the art direction and editing. Scripted by Norman Reilly Raine and Seton I. Miller. Arguably Flynn's greatest role. An old woman's disappearance during a train ride leads baffled young woman into a dizzying web of intrigue. Delicious mystery-comedy; Hitchcock at his best, with a witty script by Frank Launder and Sidney Gilliat, and wonderful performances by Naunton Wayne and Basil Radford, who scored such a hit as a pair of twits that they repeated those roles in several other films! Based on Ethel Lina White's novel The Wheel Spins. One of the great American films, and a landmark in the maturing of the Western, balancing character study (as disparate passengers travel together on the same stagecoach) and peerless action (in a lengthy Indian attack, featuring Yakima Canutt's famous stuntwork). Also the film that propelled John Wayne to genuine stardom. Mitchell won an Oscar as the drunken doctor, as did the music score. Script by Dudley Nichols, from Ernest Haycox's story "Stage to Lordsburg" (whose plot is reminiscent of Guy de Maupassant's Boule de Suif). Filmed in Ford's beloved Monument Valley on the Arizona-Utah border. If not the greatest movie ever made, certainly one of the greatest examples of storytelling on film, maintaining interest for nearly four hours. Margaret Mitchell's story is, in effect, a Civil War soap opera, focusing on vixenish Southern belle Scarlett O'Hara, brilliantly played by Leigh; she won Oscar, as did the picture, McDaniel, director Fleming, screenwriter Sidney Howard (posthumously), many others. Memorable music by Max Steiner in this one-of-a-kind film meticulously produced by David O. Selznick. A genuine American classic, based on L. Frank Baum's story of a Kansas girl who goes "Over the Rainbow" to a land of colorful characters and spirited adventure. A perfect cast in the perfect fantasy, with Harold Arlen and E. Y. Harburg's unforgettable score. Just as good the fifteenth time as it is the first time. Won Oscars for "Over the Rainbow" and Herbert Stothart's scoring, plus a special miniature award for Judy. Splendid comedy remake of The Front Page with Grant as conniving editor, Russell as star reporter (and his ex-wife), Bellamy as mama's boy she's trying to marry amid hot murder story. Terrific character actors add sparkle to must-see film, scripted by Ben Hecht and Charles Lederer. Classic Americana of Okies moving from dust bowl to California during Depression, lovingly brought to screen. Fonda, as ex-con, is unforgettable in role of his life. Darwell, as determined family matriarch, and Ford won well-deserved Oscars. Written for the screen (from John Steinbeck's classic) and produced by Nunnally Johnson. Don't miss this one. Walt Disney's eight-part marriage of music and animated images remains an amazing achievement; Taylor's narration dates it more than the content. "The Sorcerer's Apprentice" (with Mickey Mouse), "The Dance of the Hours" (with dancing hippos and alligators), "Rite of Spring" (dinosaurs stalking the earth), and "A Night on Bald Mountain" (with Chernobog, the personification of evil) are so stunning that they make up for the less compelling sequences. Also notable for groundbreaking use of multichannel stereophonic sound. Tired of making fluff, movie director McCrea decides to do a "serious" film; to research it, he sets out with 10 cents in his pocket to experience life in "the real world." Slapstick and sorrow blend seamlessly in this landmark Hollywood satire, which grows more pertinent with each passing year. A unique achievement for writer-director Sturges. Welles' first and best, a film that broke all the rules and invented some new ones, with fascinating story of Hearst-like publisher's rise to power. The cinematography (by Gregg Toland), music score (by Bernard Hermann), and Oscar-winning screenplay (by Welles and Herman J. Mankiewicz) are all first-rate. A stunning film in every way...and Welles was only 25 when he made it! Outstanding detective drama improves with each viewing. Bogey is Dashiell Hammett's "hero" Sam Spade, Astor his client, Lorre the evasive Joel Cairo, Greenstreet (in his talkie film debut) the Fat Man, and Cook the neurotic gunsel Wilmer. Huston's first directorial effort (which he also scripted) moves at lightning pace, with cameo by his father Walter Huston as Captain Jacobi. Stanwyck is a con artist who sets her eyes on wealthy Fonda - the dolt to end all dolts, who proclaims "snakes are my life." Sometimes silly and strident, this film grows funnier with each viewing - thanks to Sturges's script, breathless pace, and two incomparable stars. Everything is right in this WW2 classic of war-torn Morocco with elusive night-club owner Rick (Bogart) finding old flame (Bergman) and her husband, underground leader Henreid, among skeletons in his closet. Rains is marvelous as dapper police chief, and nobody sings "As Time Goes By" like Dooley Wilson. Three Oscars include Picture, Director, and Screenplay (Julius and Philip Epstein and Howard Koch). Our candidate for the best Hollywood movie of all time. The irony and terror of mob rule are vividly depicted in this unforgettable drama about a lynch mob taking the law into its own hands, despite protests of some level-headed onlookers. Based on Walter Van Tilburg Clark's book; superb script by Lamar Trotti. Frantic, hilarious comedy of Betty attending all-night party, getting pregnant and forgetting who's the father. Bracken and Demarest have never been better than in this daring wartime farce. Filmed in 1942. Wilder-Raymond Chandler script (from the James M. Cain novel) packs fireworks in account of insurance salesman MacMurray coerced into murder plot by alluring Stanwyck and subsequent investigation by Fred's colleague Robinson. An American movie classic, with crackling dialogue throughout. Beautifully-directed, low-key Western about Wyatt Earp (Fonda) and Doc Holliday (Mature), leading to inevitable gunfight at O.K. Corral. Full of wonderful details and vignettes; exquisitely photographed by Joseph P. MacDonald. One of director Ford's finest films, and an American classic. Screenplay by Samuel G. Engel and Winston Miller, from a story by Sam Hellman. Based on a book by Stuart N. Lake. Remake of Frontier Marshal (1939). Sentimental tale of Stewart, who works all his life to make good in small town, thinking he's failed and trying to end his life. Guardian angel Travers comes to show him his mistake. Only Capra and this cast could pull it off so well; this film seems to improve with age. Capra, Frances Goodrich, Albert Hackett, and Jo Swerling expanded Philip Van Doren Stern's short story "The Greatest Gift" (which had originally been written by Stern as a Christmas card!). American classic of three veterans returning home after WW2, readjusting to civilian life. Robert Sherwood's script from MacKinlay Kantor's book perfectly captured mood of postwar U.S.; still powerful today. Seven Oscars include Best Picture, Wyler, March, Russell, Sherwood, Daniel Mandell's editing, Hugo Friedhofer's score. Russell, an actual veteran who lost his hands, also took home a second Oscar, a special award for bringing hope and courage to other veterans. One of the greatest films ever made, a vivid adaptation of Dickens's tale of a mysterious benefactor making poor young orphan a gentleman of means. Opening graveyard sequence is a gem. Oscars went to cinematographer Guy Green and art director John Bryan. Lean, Kay Walsh, Cecil McGivern, and producers Anthony Havelock-Allan and Ronald Neame all contributed to script. Simple, realistic tale of working-man whose job depends on his bicycle, and the shattering week he spends with his young son after it is stolen. An honest, beautiful film that deservedly earned a special Academy Award (before foreign films had a category of their own); one of the all-time classics. Excellent adaptation of B. Traven's tale of gold, greed, and human nature at its worst, with Bogart, Huston, and Holt as unlikely trio of prospectors. John Huston won Oscars for Best Direction and Screenplay, and his father Walter won as Best Supporting Actor. That's John as an American tourist near the beginning, and young Robert Blake selling lottery tickets. Knockout of a sleeper in the Bonnie and Clyde tradition, stylishly (and sometimes startingly) directed. Cummins is femme fatale who leads gun-crazy Dall into life of crime. Screenplay credited to MacKinlay Kantor and Millard Kaufman (who was actually "fronting" for then black-listed writer Dalton Trumbo), from Kantor's Saturday Evening Post story. Aka Deadly Is The Female.